St. Patrick, Missouri is a small village located in the southeast part of Jackson Town­ ship in Clark County, Missouri. Irish Catholics settled it, but all nationalities and religions are represented here. The Catholic religion remains predominant. The first settlers came to Clark County, Missouri, in 1829 and settled near the present town of St. Francisville. This history of St. Patrick dates back almost that far. Many of the early settlers in America moved from the East Coast to Kentucky. Such was the case of the Riney and Simpson families. James Montgomery Simpson was born in Maryland in 1784 and married Mary A. Boone in 1807 in Washington County, Kentucky. They had five children- Rose, Celestine, Ursula, Matilda, and Mary Ann. Presumably, Mary died (between the birth of her last child, May 27, 1815, and January 3, 1816) as James married Monica McAtee January 3, 1816. John B. Riney was born in Maryland around 1782 and married Mary Ogden in 1802 in Washington County, Kentucky. They had 10 children - Margaret, Richard, Elizabeth, Charlotta, Mary Ann, Sally, James Felix, Rosella, Julia, and Matilda. The Simpson and Riney families were both in Sangamon County, Illinois, in 1829. Rev. Joseph Lietz married Richard Riney and Rose Simpson July 19, 1830. Their oldest son, John, was born in Sangamon County, Illinois April13, 1832. Richard and Rose Riney moved to what is now Clark County, Missouri, in 1833. 1t is hard to determine how many of the family came with them, but it is probable that Richard's parents, John and Mary Riney, and his sister, Mary Ann (married James Shuman), came with them in 1833. Other members of Richard's family came to Clark County, Missouri- Margaret in 1834 (married Thomas Horrell); Elizabeth in 1834 (married William Bennett); Charlotta in 1834 (married Ignatius Higdon); Sally in 1840 (married Everestus Durbin); James Felix in 1836 to Lewis County (married Mary Ann Durbin, Mary Lucas); Rosella- date unknown (mar­ried Benjamin Bennett); Julia- date unknown (married F. M. Gatton); and Matilda- date unknown (single). James and Monica Simpson and most of their children stayed in Ruma, Illinois. Children of James and Mary Simpson were Rose (married Richard Riney) Clark County; Celistine (married Elizabeth Bennett and Eleanor Brown) Clark County; Ursula (married Philip Deveraux) possibly Perryville, Missouri; Matilda (married John B. La yton) Perryville, Missouri; and Mary Ann (married John Vinson) Ruma, Illinois. Richard (born April19, 1806) and Rose Simpson (born July 19, 1810) Riney were the first' settlers at what is now St. Patrick. They settled near an Indian village - near the present Lake of the Oaks road. They were parents of eight children- John (married Mary Jane Brown); James Felix (probably married Kittie Cross? ); Henry (married Mary J. Gleason); Mary Ann (married Isodore Manning); Richard Thomas (married Rebecca McDermott); George (married Mary Owsley); Barnard V. died when three years old; and Edmund (mar­ried Sally Owsley, Lena Taylor, and Lilly Shuman Young). Richard and Rose lived the remainder of their lives there. Richard died December 18, 1858 and Rose died December 18, 1908. They are buried in the St. Patrick cem­etery. Rather interesting to note that Rose died 50 years to the day after Richard. Richard's original stone is still legible. Rose's stone was gone, so Mary Riney Merrill collected funds from Riney descendants and purchased a new one. Many of their descendants live in the St. Patrick area today. Richard and Rose Riney were my great-great grandparents. John was my great grandfather. Catholics came early to Missouri. The first Catholic Church in St. Louis was about 1770. The Diocese of St. Louis was formed in 1827. The first appointed Bishop in 1829 was Rev. Joseph Rosati. The first log church was built at North Santa Fe (now St. Patrick) in 1834 at a cost of about $75.00. The location is unknown. Rose Riney's obituary states she helped build the first church. They named it St. Patrick Church. Father Peter Paul Lafevre, from Hannibal, was the first pastor. He served many Northeast Missouri parishes as a circuit rider. Clark County was organized in 1836. Land entries prior to 1836 in Clay and Jack­son Townships were John B. Riney, John Lewellen, Moses Johnson, and James McDermott. In 1838, Bishop Joseph Rosati purchased 80 acres (west half of NWQ of Section 13, Township 63, Range 7 West) from the USA by Martin Van Buren for church property. These 80 acres (minus 15+ acres that were later sold) are still St. Patrick church property today. Father Tucker (1839), Father Cusack (early 1840s), and several Lazarist Fathers served the parish as circuit riders. Father Dennis Byrne was appointed the first resident pastor in 1846 and served until 1852. In 1852, North Santa Fe (as it was then called) was the first organized Catholic congregation in Clark County. Father Cullenan and Father James Murphy were short-term pastors. Few parish records were kept and very little is known about his era. Father Bernard Patrick McMenomy, born in County Donegal, Ireland, came to North Santa Fe in 1854. It was his first parish. He sold 10 acres of church property in individual lots and platted a town he named St. Marysville. John Daly purchased property in St. Marysville October 22, 1857, and it has been in his family continuously ever since. Thelma (Katy) Curfman lives there today. When Father McMenomy applied for a post office it meant another name change for the village- there was another Marysville in Clark County. Christianity had come early to Donegal, Ireland, as St. Patrick visited it passing through the Bunesmore Gap northward to Ineshaiven. Perhaps Father McMenomy thought the Irish and their Chris­tianity had come early to Missouri also-hence, he renamed it St. Patrick. The post office was granted and John McSorley was appointed postmaster March 12, 1858. The post of­fice was discontinued November 23, 1860. The small log church had become too small for the parish. Father Turnell was prob­ably the pastor that planned the construction of the brick church in 1860 (cost about $3,000) and the brick rectory in 1861. The first resident pastor had been appointed in 1846 but had no residence to live in until 1861. The priests stayed in various homes (many times with the Ford family) and spent many hours in the saddle traveling to the Catholic mission churches in La­ Grange, Canton, Al­exandria, Williams­ town, Kahoka, and Wayland. Legend tells us that homemade bricks were made for the 1860 church in a brick kiln located east of the St. Patrick cemetery. The brick masons wouldn't use them because they were too soft, so bricks were purchased for the church. The homemade bricks were used in the 1861 rec­ tory. This rectory made from the homemade bricks stood for nearly 100 years and by 1900 the church walls were crumbling. The brick church was a large, beautiful building. The rectory had two stories, large halls, two stairways, nine rooms with high ceilings, and had a stove in every room. Father Patrick Gleason came to St. Patrick about 1866. The St. Patrick church filed a petition for incorporation in March 1866. The post office re-opened November 29, 1867. The first July 4th picnic was held about 1867- a tradition that lasted over 1000 years. The building of the church and rectory, during a depressed economic times forced the parish to borrow money from several individuals. All loans were repaid except one. Money was borrowed from Stephen Roach in 1869 and 40 acres of church land were given in a deed of trust. Stephen Roach made his will April 9, 1873. In his will, he willed the land back to the church if he died before the loan was repaid. Stephen Roach died July 16, 1873. James Collins, Administrator, released the deed of trust February 12, 1880. Lewis County obtained a Catholic priest in 1869 so Father Gleason had only three mission churches in Alexandria, Wayland, and Kahoka. The post office was discontinued September 24, 1869. Thomas Breen purchased 5.47 acres of church land December 12, 1870. Father William Maddox was appointed pastor in 1871 and drowned in 1876. He was buried in the St. Patrick cemetery. His successor was Father Eugene Coyle. The post office re-opened March 4, 1878. The church petition for incorporation (filed in 1866) was granted August 13, 1879. These men were appointed the first Trustees of the church: Joseph Uhlmeyer, Charles P. O'Farrell, Lewis Moore, and James Ryan. A small amount of church land (150' square at SW corner of Block 3) was sold to Joseph Uhlmeyer January 20, 1879. Parish records are few and very little information could be obtained about the following years. Father J. J. Mahen (1884) (church membership was about 300 in 1887); Father John Cosgrove (1889); Father Tim Dempsey; Father Peter J. O'Rouke (1894); and Father Frances Gilfillan all served as pastors. Father P. F. Cooney became pas­tor in 1897. The brick church needed to be replaced so he built a white frame church at a cost of about $2,000 in 1903. Church services were held at Reischling's Store while it was being built. This church was building on the same site as the brick church (where the Shrine of St. Patrick stands today) and used the reverse side of the 1860 cornerstone for its cornerstone. The solicitors for this church were: James Ahem, Henry Danker, Joseph Weiss, C. J. Boudreau, Henry Forstove, and Pat King. The building committee was: James Ryan, Ber­nard Kelly, Joseph Logsdon, President Martin Danker, and Treasurer, J. J. Wheeler. Father Cooney was followed by Father S. J. Brady. When Father P. J. Carney became pastor, he began collecting funds for a Catholic school. There was probably a school located here earlier but the location and years are in doubt. Old Atlases mention No.3 St. Marysville School- Lot 7, Block 2. The late George Wiegand stated there was a school south of the Larry Logsdon home that burned in the early 1880s. His mother had attended school there. After it burned, the children attended school at Rabbit Ridge or Victory (it was known by both names) east of the St. Patrick cemetery. Enumeration lists of 1902 and 1903 list Rabbit Ridge as No.3. Perhaps it was built or renumbered after the St. Marysville School burned. Accurate information on the early schools is very hard to obtain. The new parochial school was built of cement and was modern in design. The school had three stories, ample classroom space, and later one of the first indoor basketball courts in Clark County. The cornerstone reads September 1, 1909, and it cost about $11,000. It was located north of the church. Father E. A. Bolger was actively in charge of the work done on the school. Classes were held for a short time in the church until the school opened in 1910. In May 1910, Clark County had 92 school districts and District No. 3 became St. Patrick No. 85. The Sisters of Divine Providence of San Antonio, Texas staffed this new school. Old, incomplete records indicate the Sisters left the parish in 1912 and lay teachers taught in the school for three years. The St. Patrick parish changed from the Diocese of St. Louis to the Diocese of St. Joseph in 1912, while Father Daniel J. O'Donoven was pastor. On October 5, 1912, John Kirchner purchased a small amount of church land (30'S 150' E of SW corner of Block 3, 115' E 60' N). Joseph Reischling purchased a small amount (1.75 acres) of church land April 29, 1913 (NW corner of SW 1/3 of NWQ of S13-T63 R7W running E 383' to county road south 200' N 200' 2" W 383' to Section Line). The Sisters of St. Francis from Clinton, Iowa, came to operate the school in August 1915. These devoted Sisters taught in the school for nearly 40 years. The Sisters lived in the basement of the school for several years and did much of the janitor work. The post office was again closed Sep­tember 15, 1916. When Father Denis Mulcahy came in 1917, he started collecting funds to build a convent for the Sisters to live in. Bill Uhlmeyer built the convent about 1925. Perhaps the Sisters' lives became a little easier then. The post office re-opened October 6, 1921 and John N. Kirchner was appointed postmaster. His son, Nick Kirchner, was assistant postmaster. The post office was in the John N. Kirchner store building. The build­ing was built in 1914 and has a ridge row with shamrocks on the roof. A small amount of land was sold to John F. and Anne Uhlmeyer for a star in 1923- E 110' W 110 AND 135' S to beginning. A large statue of St. Patrick (do­nated by Mr. and Mrs. J. J. Wheeler) was placed on the front of the school in 1923. It was placed outside, at the third floor level, over the school entrance. It was made of imported material, weighed about 1,000 pounds, and was purchased from Daprats Statuary Co. in Chicago, Illinois. It was shipped to Canton and brought to St. Patrick in a wagon drawn by horses. This statue, of the patron saint of Ireland, was guaranteed to outlast the niche in which it was placed. Mr. Wheeler was born in County Longford, Ireland. Nick Kirchner purchased his first truck in 1926. His trucking firm was later combined with a fertilizer, seed, and feed business. This business and Kirchner's General Store provided employment for many people in our community for years. Nick Kirchner died in 1991. Bill Uhlmeyer, a local carpenter, built a stable for the inside Nativity about this time. No one is exactly certain of the date. In 1987 his son, Alvin Uhlmeyer, had a plate made to be placed on the crib - made in 1927. It is still used at Christmas time. Father Jerome Walsh came in 1927 and died in 1928. Father Torn Dempsey, born in County Offaly, Ireland, carne to the parish in 1928. He was a man dedicated to his work of making things better for the community. Our dirt roads became almost impassible when they were muddy. He worked to obtain gravel roads for the area. This added work did not help his already failing health. He did not live to see his work accomplished - he died in 1931. The road named Route Z or Dempsey Highway was graveled (now blacktop) about 1935. A sign, Dempsey Highway, was placed at the junction of Highway 61 and Route Z, a memorial to a man and his dream. In 1929, R. C. and Laveta Logsdon's General Store was established. This store con­tinued as a business in St. Patrick until the death of Laveta Logsdon in 1994. Following Father Dempsey's death, the St. Patrick parish was without a resident pastor for over a year. Father Philip Gannon took care of the St. Patrick parish as well as his own Canton parish. He is probably best remembered for the winning basketball teams he coached! A small amount of church land was granted for a road in 1931. Father Jeremiah O'Connor came to St. Patrick as resident pastor in 1932 and served until1935. This was depression time and the farming community was in a deep financial crisis. Another priest came - a young Irish priest full of enthusiasm, dauntless energy, and a DREAM. Arriving one rainy evening, Father Francis O'Duignan drove through the village before he realized he had arrived. When he found the rectory, he was greeted warmly by the housekeeper, Annie McDermott. Father O'Duignan was born July 11, 1901 in County Longford, Ireland, came to America in 1927, and to St. Patrick in 1935. Here he was faced with loneliness, buildings in need of repairs, the parochial school in financial trouble, and his first Sun­ day collection was $1.72. As he struggled with his problems, he hoped to leave the parish a better place than he found it. Through the efforts of Father O'Duignan, the parochial school was changed to a public school with the Sisters of St. Francis still in charge. The small community was very proud of its four-year fully accredited high school. The Sisters Chapel had been in the school basement and now had to be removed. A chapel was added to the east end of the convent about 1937. It had a shamrock shaped stained glass window with St. Patrick in the center. Father O'Duignan had a dream of building a Shrine to St. Patrick. St. Patrick, pa­tron saint of Ireland, is probably the only patron saint that belongs to the entire world. He had found the place to build the Shrine- St. Patrick, Missouri, the only town in the world (with a post office) to bear the name of Ireland's patron _saint. Over 1,000 churches in the world are named St. Patrick, but this is the only town. He believed St. Patrick would bless all who aided in making this Missouri Shrine possible. Father O'Duignan began making plans. Knowing the task of building a Shrine was too great for his small rural parish, he would ask others to help him. He wanted St. Patrick to be known all over the world . In 1936, he designed a green shamrock cachet and stamped it on 500 letters. John N. Kirchner, Postmaster, hand stamped the regulation March 17 postmark on these 500 envelopes. Father O'Duignan asked the typing classes to type letters (how we would have loved a copy machine!) explaining his dream of building a Shrine that would be mailed to Irish surnames (selected from city telephone directories) asking for donations. Each year the volume of mail increased. Letters were sent to the rectory to have the shamrock cachet put on them. They were then taken to the post office for a March 17 postmark. Many of these letters contained donations for the Shrine. John N. Kirchner retired in January, 1940. John Logsdon became Acting Postmaster and was appointed Postmaster in April, 1940. The post office was moved to the Logsdon's General Store. In 1941, the Rabbit Ridge schoolhouse was moved to St. Patrick to be used as a "band house." The band students were delighted with their own private music building. The teachers and other students were also delighted that they didn't have to li ten to music all day! Father O'Duignan increased the publicity of the small village. He handled thou­sands of letters on March 17, wrote articles for newspapers, had girl flown from Ireland for St. Patrick's Day Queen, had shamrocks flown from Ireland and dropped in St. Patrick at the dedication of the Shrine, began a huge St. Patrick's Day celebration, etc. He had found ways of making St. Patrick a name to remember. A small tract of church land was sold to R. C. and La Veta Logsdon August 3, 1945 (beginning SE corner of a tract of land formerly owned by J. Reischling- S 100' W 383' 100' E 383', to place of beginning). John Logsdon resigned as Postmaster in 1948. Laveta Logsdon was appointed Act­ing Postmaster and later Postmaster on May 26, 1949. The post office was moved across the road to the R. C. Logsdon's General Store. Anna Marie Hennessy, a former resident of Wayland, Missouri, brought the first of many Chicago tours to St. Patrick in 1948 or 1949. These Chicago visitors donated money and many items for the proposed Shrine. During these years of collecting Shrine funds and recruiting priests for the Diocese, Father O'Duignan spent several summers in Ireland. Canton priests, Father John Kenny (mid-1940s) and Father Michael O'Rourke (early 1950s) conducted services for him. The old brick rectory was nearly 100 years old and needed to be replaced. Frank Beard of Kahoka, Missouri was the architect. Bryon Whiston, owner of Whiston Construction Company, Can­ ton, Missouri, built the rectory in 1951. Byron Whiston was a member of the par­ish. The new rectory had a full basement, nine rooms, two bathrooms, and a beau­tiful walnut staircase. Bud Treadwell donated the walnut. A shamrock of Bedford stone was installed in the front of the rectory and a Celtic cross on top. It cost about $25,000. Some lay teachers were hired for the high school in the school year 1950-51. Lay teachers staffed the entire school in the school year of 1953-54. An era of nearly 40 years was finished when the Sisters of St. Francis did not return as teachers. Many memories of the devotion and inspiration they gave to our parish will always be remembered. Their lives weren't easy here. They were isolated in a small, rural commu­nity without a car or public transportation- but they always had love and compassion for their students. When I saw a grade school teacher of mine, Sister Scholastica (now Sister Catherine Coupe) after nearly 50 years, she still remembered some of the names of the students she taught at St. Patrick. Memories of Latin classes, band, music and academic contests, English, library, etc. still remain in the hearts of their former students. Several girls from St. Patrick followed in their footsteps and became nuns-some belonging to the Sisters of St. Francis. Sister Pauline Logsdon, Sister Eleanor (Louise Dunning), and Sister Agnes Clare (Susan Henderson) joined the Sisters of St. Francis and are still living. The St. Patrick parish was changed from the Diocese of St. Jo­seph to the Dioceses of Jefferson City July 2, 1956. The Shrine of St. Patrick was to be built - the fulfillment of an "impossible dream." Maurice Car­ roll of St. Louis was the archi­tect. Bryon Whiston, owner of Whiston Construction Company, Canton, Missouri, built the Shrine. It was constructed on the same site as the former church. It cost about $250,000. The Shrine of St. Patrick is fashioned after the St. Patrick's Memorial Church of Four Masters in Donegal, Ireland. The Church of Four Masters is named after the Four Masters or Annalists who wrote the Annals of the Four Masters between 1632-1636. Most of the early Irish history had been lost so four Franciscan Monks in Donegal compiled the ancient Gaelic history of their country. These men were Michael O'Clery, Petegrine O'Clery, Fearfeasa O'Mulconry, and Petegrine O'Duignan. The Shrine is Celtic in design- semi-circular recessed doorways, central rose win­dow, Celtic crosses, and a round bell tower that is native to Ireland. The round tower has a circular stairway leading to the choir loft. It replaces the ladder used in Irish churches. When the Irish Monks were in danger they went to the top of the tower and pulled the ladder up after them. Their enemies to harm them, must either starve them or burn them out. There is a full basement under the Shrine. The exterior stone wall pattern is stone-rubble squared . This stone is grey granite from Lannon, Wisconsin. This stone was shipped to Canton, Missouri in coal cars and brought to St. Patrick by the Whiston Construction Company. Bedford stone is used around the doors and windows. Ernest Stone of the Hamilton Marble and Tile Company, Hamilton, Illinois made and installed all the altars and communion rail in 1956. The marble was supplied by Carthage Marble Corporation, Carthage, Missouri. The main altar and St. Patrick's altar were made of Forest Green marble mined in the Aosta Valley in northwest Italy. "The quarry is located high above the central part of the valley on a strange projection that sticks out like a balcony from the almost vertical flank of a mountain." Workmen climb up a narrow footpath (it takes two hours) and remain for 15 days. Working materials are brought up by cable. Blocks of Forest Green marble go down the mountainside at angles of 45 to 80 degrees on wooden sledges controlled by steel cables. The distance to cover is 1,500 yards - time required is six to eight hours. A relic of St. Patrick was placed in the main altar. The two side altars are Loredo Chiara marble from Italy. The communion rail is Rojo Alicante marble from Alicante, Spain. This marble is light copper with overtones of pink, rust, and terra cotta. Probably the most impressive features of the Shrine of St. Patrick are the 37 stained glass windows made by the State Glass Company in Dublin, Ireland. They were designed from the Book of Kells- one of the most beautiful illuminated manuscripts in the world. The Book of Kells is on display in the Long Room at Trinity College, Dublin, Ire­land. On the south side of the Shrine (from front) are: St. Pius X, St. Louis, Sacred Heart of Jesus, Assumption of Blessed Virgin Mary, St. Joseph, St. Anne, St. Francis Cabrini, St. Paul, St. Therese, St. Francis of Assisi, St. Agnes, St. Anthony, and St. Peter. On the north side (from rear) are: St. Cecilia, St. James, St. Catherine of Siena, St. Christopher, St. Boniface, and St. Nicholas. There is a side chapel in special honor of St. Patrick. A life size statue of St. Patrick stands on the altar- with a shamrock in his hand and snakes at his feet. Legend tells us he used the shamrock to explain the Holy Trinity and he drove the snakes out of Ireland. Stained glass windows of St. Columcille, Irish Mission­ary; St. Laurence O'Toole, Bishop of Ireland; St. Brigid, patroness of Ireland; and St. Patrick, patron of Ireland, are in the side chapel. Probably the most impressive window of all is the "rose window" over the main entrance. It has a picture of St. Patrick in the center and symbols of Ireland's four provinces surround it. The provinces are Ulster, Leinster, Munster, and Connaught. Anna Waples in memory of her Aunt Anna McDermott who was the priest's housekeeper for many years donated the win­dow. The Most Rev. Joseph Marling, Bishop of Jefferson City, Missouri, dedicated the beautiful shrine of St. Patrick March 17, 1957. Father Francis O'Duignan and his broth­ers, Father Michael O'Duignan and Father Denis O'Duignan, offered the Solemn High Mass of Dedication. Father Francis O'Duignan had a History of St. Patrick booklet printed for the dedication. In 1957, the Catholic Church at Wayland, Missouri became a mission of St. Patrick. It had been a mission of St . Michael's, Kahoka, Missouri, for many years. Father Francis O'Duignan was transferred to another par­ish in the fall of 1957- not being allowed to enjoy his beloved church for very long after labor­ing 22 years to build it. Father John Vandenberghe was the pastor for a few months in late 1957 and early 1958. For the 1957-58 school year, the Sisters taught high school students in the Shrine basement. Folding walls divided it into rooms. Father Joseph O'Rourke came as pastor in 1958. In January 1958, nearly all grade school students transferred to the parochial school. In the 1958-59 school year, the grade school children returned to the public school, but the high school remained parochial. In the school year of 1961-62, the Sisters did not return and the high school students trans­ferred to Kahoka High School, Kahoka, Missouri. School districts in southern Clark County combined into the CCR-1School District in 1965. The grade school continued at St. Pa trick until the year of 1967-68 when all students went to Kahoka to the CCR-1 School. Another era was finished with the closing of the school. Rabbit Ridge schoolhouse, which had been used for a music building, was no longer needed so Redmond Raleigh tore it down. Father Patrick Mel Newman came in 1967 and died in 1968 while still pastor. Fa­ther Elmo Kurtz from Quincy, Illinois, and Father Thomas Gray of Canton, Missouri came for services during Father Newman's illness and after his death. 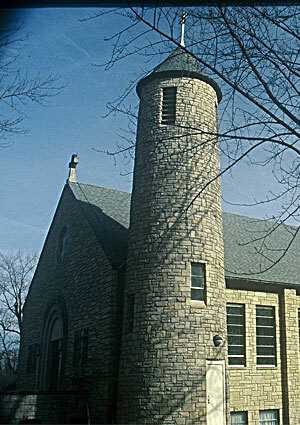 During the summer of 1968 and 1969, St. Martha's Catholic Church in Wayland, Missouri became a mission of St. Michael's, Kahoka, Missouri, again. Father Senan O'Connell was appointed pastor in 1968. The main altar in the Shrine was removed and replaced by a table made from the marble altar. This change allowed the priest to face the people during Mass. Another change came to the village of St. Patrick. Laveta Logsdon, Postmaster for 21 years, resigned in November, 1970. During her years as Postmaster, the greatest vol­ume of mail had arrived to be postmarked on March 17- still with a hand cancel. Laveta Logsdon recalls some of the highlights of her career. In 1957, Dadant & Sons, Hamilton, Illinois, brought 27,000 letters, in the back of a pickup truck, to be shamrocked and post­ marked . The Shamrock Restaurant in Kansas City, Missouri, sent 1,500 letters the same year. A St. Louis man, Robert J. O'Reilly, averaged 2,500 letters per year. The volume of mail was about 40,000 letters. The post office was made a Third Class Post Office in 1957 and Anna Uhlmeyer was the clerk. When Laveta Logsdon resigned, Anna Uhlmeyer Logsdon became OIC (Officer in Charge) November 30, 1970 and was appointed Post­ master July 17, 1971. She was the daughter-in-law of Laveta Logsdon and the post office remained in the store. The convent was no longer used, so David Hartwig tore it down in 1972. Father Senan O'Connell went to Rome, Italy for further study in the fall of 1972 and returned to our parish in December 1972. On January 14, 1973, Father O'Connell was killed in an auto accident. A native of Ireland, he wanted to be buried in the parish he was serving at the time of his death. He is buried in the St. Patrick cemetery. During Father O'Connell's absence and following his death, Father John Walsh, Kahoka, Missouri and Father James Wheeler of Quincy, Illinois, (the only boy from St. Patrick parish to become a priest) had services in our parish. Father Fred Yehle came to our parish on April13, 1973. The tall, white haired, smil­ing priest (long past retirement age) soon endeared himself to almost everyone in the parish. Mr. Thompson tore down the school. Many students had received their education in the venerable old building, but its usefulness was over. The St. Patrick statue had outlasted the niche where it was placed as predicted. Tom Rossi placed the statue on a high base on a grassy knoll in front of the Shrine. Later, two dusk to dawn lights were put there by the efforts of Wayne Wheeler. The community felt the loss when Father Yehle retired and moved to Jefferson City, Missouri, Sept. 17, 1979. The 1979, Postmaster Anna Logsdon obtained a special green pictorial postmark that was used on March 17 only. She also had a special March 17 envelope printed that she sold. For the first time in 133 years, we were without a resident pastor. St. Patrick had to depend upon a neighboring parish to share its priest, instead of St. Patrick providing a priest for others as they had done for many years. Father Gerald Kaimann of Canton, Missouri, served as a temporary pastor, although he had two parishes of his own. H wanted a History of St. Patrick printed for the 25th Anniversary of the Shrine of St. Patrick Father Kaimann asked Ellen Krueger to write it. Father P. J. Cletus came to our parish as a resident pastor in September, 19 0. He was formerly of Allapply Diocese, Kersala State, India. He organized a St. Vincent de Paul Society for the welfare of needy people. He was interested in the parish youth and organized a CYO. He was transferred to Jefferson City, Missouri, July 15, 1981. Again, we were without a resident pastor. Father Gerald Kaimann was appointed pastor, along with his other two parishes- Canton and LaGrange. Sister Roberta Westrick, Sisters of Charity, came as our first Pastoral Minister in the fall of 1981 to aid in all three parishes. She lived in the St. Patrick Rectory. The St. Patrick statue had been devoid of paint for many years. Rose Moore (for­merly of the parish), an art teacher in Mercer, Missouri, painted the statue and restored it to its former beauty in 1981. A History of St. Patrick, written by Ellen Krueger, was published in December, 1981 and reprinted in the summer of 1982. A new business, St. Patrick Meat Processors, Inc., held its grand opening July 25, 1982. It was located 11/2 miles NE of St. Patrick on Dempsey Highway. The owners and operators were Mr. and Mrs. Bill Richmond and Mr. and Mrs. Charles Allen. Anna Logsdon resigned as Postmaster in March, 1983. Kae Parker of Canton, Mis­souri, was appointed Officer-in-Charge. The post office hours were cut from eight to four hours a day. Curtis Kirchner was appointed Postmaster in November 1983. There had been a March 17 pictorial postmark since Anna Logsdon had obtained the first one in 1979. Curtis Kirchner had a pictorial postmark approved for March 17, 1984 and had a postal sub-station in the Shrine basement, during dinner, for the first time. The Shrine of St. Patrick sponsored the pictorial cancel. The Shrine of St. Patrick sold its first specially designed March 17 envelope. In the fall of 1984, the area churches re-grouped. Canton, LaGrange, and Ewing were placed together. St. Patrick was grouped with Kahoka and Wayland. Father Robert Duesdieker became our pastor and lived in Kahoka, Missouri. A new business, Old Irish Antique Shop, owned and operated by Marcia Hardin and Myrna Daughtry, opened October 20, 1984.1twas in the restored 1914John N. Kirchner Store building. They are great granddaughters of J. N. Kirchner. The Allens left the St. Patrick Meat Processors November 1,1984 and the Richmonds became the sole owners. In December, 1984, Postmaster Curtis Kirchner (great grandson of J. N. Kirchner) moved the post office to the former J. N. Kirchner Store building. The post office had been in that building from 1920-1940. The first shamrock cachet had gone through the mail from this building. Curtis Kirchner donated an insert to be placed in the March 17 Shrine envelope in 1985. Curtis Kirchner resigned as Postmaster November 8, 1985. Mary Walker was Acting Postmaster. She was appointed Postmaster May 10, 1986. Father Francis O'Duignan was retired and living in California. The Shrine of St. Patrick was without a resident pastor and the March 17 mailings at the post office had decreased the past years as people forgot about St. Patrick. Father O'Duignan asked Ellen Krueger to increase the Shrine publicity as he didn't want "his church" to be closed. An increase in publicity could never have been accomplished without the help of Father Rob­ert Duesdieker who helped in so many ways. His interest and dedication to the parish were greatly appreciated. The first green brochures were printed in February, 1986- to be given away to help people become more aware of St. Patrick. A page was purchased in the ILIAMO Travel Guide for the first time. The 1986 Shrine envelope honored Father O'Duignan. The insert was written and donated by Ellen Krueger. The sale of March 17 envelopes produced a volume of mail. A St. Patrick post office box was rented by Ellen Krueger to accommodate it. Rose Moore donated her time and re-painted the St. Patrick statue in the summer of 1986. Sister Roberta was replaced by Sister Mary Runde (Sisters of Notre Dame) as Pas­toral Minister on August 1, 1986. Pat Riney placed the school cornerstone on one side of the St. Patrick statue in the summer of 1987. The 1903 church cornerstone had been placed on the reverse side of the 1860 church cornerstone. He placed this stone on the opposite side of the statue. The added publicity helped to interest people in St. Patrick. Newspaper reporters, TV coverage, radio interview, St. Louis tour busses, visitors, OATS and other vans, etc., were visible on March 17 during the day. A breakfast and lunch were served to accommodate the day­ time crowd- previously only an evening meal was served. Many tours are scheduled throughout the year. Several women's clubs and tour busses have toured the Shrine and ate lunch there. A national Model T tour, representing 23 states, visited St. Patrick and toured the Shrine in 1987. Students from the University of Missouri campus at Rolla, Missouri, visited in March, 1988. They were dressed as St. Patrick and his court. Ja­son Richmond (seven years old), dressed as a lepre­chaun, was appointed Mayor for the day. Rolla stu­dents had wanted their picture taken with the Pas­ or and the Mayor, and naturally, a small village didn't have a Mayor. Father Robert Duesdieker, Pas­tor, proclaimed Jason Richmond as Honorary Mayor for that day and for March 17. Thanks to Leo Henning, WGEM Radio, Quincy Illinois, sent its mobile unit to broadcast from St. Patrick for the first time. Bob Joye interviewed local people and talked to Msgr. Francis O'Duignan in California and Tommy Murphy, a radio presenter, in Ireland. Street signs were erected in St. Patrick following the 1854 Plat Map in the spring of 1988. Mary, Scott, and Jackson Street signs were erected. Harrison and Clark streets no longer exist. Father O'Duignan had named the street leading to the rectory Erin Avenue. Father Robert Duesdieker named the semi-circle drive in front of the Shrine Erin Circle. These two streets did not exist in 1854, but we erected signs for them also. Thelma (Katy) Curfman furnished the Plat Map and the idea. Nancy Kirchner do­nated the boards, Bill Ryan painted the signs, Kenny Krueger donated the pipe, and Katy Curfman and the Krueger family erected them. Sister Mary Runde left the parish June 30, 1988 and was replaced by Sister Alma­ Maria Van Buren, a Dominican. Sister Mary had begun plans for a Shrine Museum, devel­oping an idea suggested by Father John Walsh. Sister Alma-Maria and Ellen Krueger car­ried on with her plans. The Museum was opened in the fall of 1988. A Shrine of St. Patrick sign was placed above the Dempsey Highway sign at the junction of Highway 61 and Route Z on Dempsey Highway. In 2016 this sign was replaced. March 17, 1989 was of special interest to the community of St. Patrick. Tommy Murphy, a radio presenter from Ballina, Cotmty Mayo, Ireland, was a special guest in St. Patrick. Leo Henning arranged for Tommy Murphy to come to the Tri-State area March 10 through March 20. At the same time, Mr. and Mrs. Leo Henning would be in Ireland. This cultural exchange had WGEM Radio carrying reports from Ireland to America and from America to Ireland for this 10-day period. GEM Country 105 FM radio broadcast from St. Patrick from 6:00 a.m. to 6:00p.m. on March 17. Bob Joye, Tammy O'Neil, and Tommy Murphy interviewed local people and visitors throughout the da y. Five tour buses came from St. Louis for the first time on March 17, 1990. Tommy Murphy and WGEM broadcast to Ireland throughout the day. Mary Walker resigned as Postmaster on May 18, 1990. Mary Ann Barnes was Office-in-Charge. Father Robert Duesdieker left the parish August 1, 1990. Many repairs and improvements were made during his years as pastor. His interest in publicity and the parish was much like the philosophy of Father O'Duignan- he wanted to leave St. Patrick a better place than he found it. Father Robert Kurwicki replaced him. Harriet Johnson was a p­ pointed Postmaster December 1, 1990. The festivities, coverage, and visitors continued to grow on March 17. In 1991, St. Patrick was the "Town of the Week" on WGEM-TV, Quincy, Illinois and was mentioned on the Today Show by Willard Scott. Father Hugh Behan, editor of the Catholic Missourian , the newspaper of the Diocese of Jefferson City, spent the day in St. Patrick. KMEM Radio of Memphis, Missouri, gives us extensive coverage every year. The parish was sad to learn of the death of Msgr. Francis O'Duignan in June, 1991. Rose Moore donated her time and talent and repainted the St. Patrick statue in September, 1991. Father Michael Murphy came as our pastor February 7, 1992, replacing Father Robert Kurwicki. In the summer of 1992, the Shrine congregation realized how important our stained glass windows are to the Shrine. They were removed for cleaning and repairs and were out of the Shrine during most of June and July. How different the Shrine looked with the sunlight corning through the clear glass storm window instead of the vibrant colors of o u r stained glass. Harriet Johnson resigned as Postmaster October 1, 1993. Fred Wiewel was Officer­ in-Charge until November 15, 1993 when he was replaced by Cathy Hunziker as Officer­ in-charge. On July 9, 1994, Richard Michael Lewis was appointed Postmaster. The DA R donated a new flag to the post office in an impressive ceremony October 21994. Two of our stained glass windows had plaques listing their donor. On October 1994, donor name plaques were places on all the Shrine windows except one. The donor of the St. Maria Goretti window is unknown. Changes were made with the March 17 pictorial cancel in 1996. Previously it could be. used only on March 17- now it could be used from March 1-17 with the date changing daily. How happy folks were that their St. Patrick's Day cards could ha ve the pictorial cancel and still arrive by March 17! In 1997, this was extended to March 1-30. Street signs from the 1854 Plat Map had been erected in St. Patrick in 1988. They were replaced in July, 1996. The Kruegers donated the boards and paint for pole . Jeff Shuman donated paint, time and talent and painted the new street signs. Sister Alma­ Maria Van Buren, Pastoral Minister, left the parish July 1, 1996 and was not replaced . St. Patrick was placed on the Internet for the first time. The pages are set up in County Mayo, Ireland and are widely read. This new form of publicity has become very popular. Father O'Duignan had a shamrock medal he gave people who donated money to the Shrine building fund. The Shrine had many requests for this medal through the years. Our search was ended when a company was located in 1997 that made a reproduction of the 1950's shamrock medal for the Shrine to sell. When the Shrine was dedicated in 1957, Father O'Duignan had an airplane drop shamrocks in St. Patrick. To help commemorate the Shrine's 40th anniversary, Jerry Davis of Canton, Missouri, dropped shamrocks from his plane on March 17, 1997. A St. Louis TV station sent reporters in a helicopter to video the "shamrock drop!" More changes for the parish in July, 1998: Father Michael Murphy left our parish. The Shrine of St. Patrick was to be grouped with St. Joseph's Catholic Church in Canton, Missouri and · Notre Dame Catholic Church in LaGrange, Missouri, again. Father Tom Alber was our Sacrament Minister and Brother Francis Tyrrell became our first Pastoral Administrator. Father Tom Alber resides in Monroe City, Missouri, and Brother John Francis Tyrrell in Canton, Missouri. March 17, 1999 was the l0th anniversary of the first visit of Tommy Murphy to St. Patrick on St. Patrick's Day. He was given a plaque in appreciation for his ten years of being Honorary Mayor of St. Patrick and coming from Ireland each year to celebrate with us. Tommy Murphy has radio shows in Ireland and America where he gives St. Patrick a lot of free publicity. A brass plaque of St. Patrick (notation on it-T Boyle 1954-) had been in a storage cabinet for years. Its origin is unknown. Brother John Francis Tyrrell had it cleaned, framed, and hung on the Museum door. The Catherine Schutte Memorial Fund paid for a gravel road all around the St. Patrick cemetery. David and Greg Danker donated some land so the road could be built on the east side of the cemetery. An anonymous donor purchased a statue of Mary and a statue of the Sacred Heart to be placed in the cemetery. The Jubilee Year of 2000! A New Century and a New Millennium. The Shrine of St. Patrick was designated as one of the 11 pilgrimage sites in the Diocese of Jefferson City, Missouri. A new utility shed had been badly needed for many years. John Brennan began a campaign to collect funds for the shed. This white and green utility shed was completed in June, 2000. Brother John Francis Tyrrell left as our Pastoral Administrator in October, 2000. Father Tom Alber remained as our pastor. Rev. Mr. Robert De Pyper replaced him in No­vember, 2000. He is our first Deacon. Deacon De Pyper and his wife, Millie, came from St. Louis, Missouri and live in Canton, Missouri. Dr. Ken Luebbering (Professor at Lincoln University) and his wife, Robyn Burnett, made two trips to St. Patrick photographing the stained glass windows in the Shrine. Their book, "Gospels in Glass- Stained Glass Windows in Missouri Churches" was pub­lished in November, 2000. How proud we are to be one of the 75 Missouri churches se­lected to have a window (Shrine- St. Brigid) included in this publication! The Shine of St. Patrick fame continues to grow. Many national magazines - Mid­ west Living, National Geographic Traveler, Country America, Irish America, etc.- in­clude items about March 17 in St. Patrick. Jim McCarty, editor of Rural Missouri, spent St. Patrick's Day in St. Patrick and had a large article in his magazine. The Des Moines Register, Des Moines, Iowa sent a reporter and photographer for the first time in many years. Local newspapers, magazines, radio, and TV are very generous with their coverage that pro­ motes St. Patrick. Leo Henning, General Manager of WGEM Radio & TV, Quincy, Illinois, brings a mobile radio unit to broadcast to Ireland and TV reporters on March 17. The volume of mail continues to increase- over 20,000 letters from also states and many foreign countries were postmarked with the pictorial cancel in March, 2000 - all with a hand stamp. Thousands of specially designed envelopes and postcards are sold each year. Artists donate their time designing and drawing the envelope and pictorial postmark. The Shrine of St. Patrick sponsors the pictorial postmark and sells the envelopes. Artists drawing these since 1985 are Tom Junkins, Bill Richmond, Aaron Watson, Gene Johnson, and an artist that asked to remain anonymous. Many people donate souvenirs to be sold by the Shrine. Other people help with sales, cachet envelopes, type, make copies, deliver posters, donate game prizes, prepare special Irish music, tour guides, and the list goes on. So many people- so much time and talent- donated to the Shrine of St. Patrick. Truly, St. Patrick has blessed the people of our parish. The passing of the years has changed the village of St. Patrick. Many businesses, too numerous to mention, have come and gone. There have been barbershops, garages, oil trucks, service stations, taverns, blacksmith shops, grocery stores, trucking firms, etc. Gone also is the school and convent- only the church remains as the central part of the community. The people of the parish still celebrate St. Patrick's Day ,on the Sunday closest to St. Patrick's Day, a day filled with fun, Leprechauns, food, games, Mass, conclusion of the Novena, music, tours, and visitors. St. Patrick is known all over the world for its unique name - Father O'Duignan made it a name to remember. The Shrine of St. Patrick stands in majestic splendor- the fulfillment of an Irishman's "impossible dream" and a living memorial of the faith our Irish ancestors brought here so many years ago. The statue of St. Patrick keeps its silent and eternal vigil over the Shrine of St. Patrick and the people of the parish today. May the name of St. Patrick live forever!